INDIANAPOLIS – The second day of practice for the 98th running of the Indianapolis 500 began on a sad note, when I arrived early in the morning at the IMS Media Center and I learned of the passing of legendary IndyCar mechanic and car builder A.J. Watson. I was fortunate to spend some time with Mr. Watson, a Month of May not so long ago during an Indy 500 Old Timers gathering along with my good friend, and a peer of Watson’s, Ray Nichels. Watson was American auto racing royalty. Getting back to the business of the day, the second full practice at the world’s most prestigious speedway proved to be fast and furious. On the day, a grand total of 2286 laps equaling 5,715 miles were covered by thirty entrants in this year’s Indianapolis 500. Not one “T” or backup car was used during the session. At the beginning of practice, a track temperature of 97 degrees, coupled with a 78 degree ambient temperature and relative humidity of 71%, made for a Brickyard full of grip. “Happy Hour” was unusually busy as the threat of rain over the next 3 days has teams greatly concerned about track time when it comes to both working on qualifying and race setups, let alone the ability to run in traffic. For the second day in a row there were no on-track incidents. A handful of yellow flags for light rain and some debris did little to keep the car s off the track and as the day went on the speeds began to ratchet their way higher. Late in the session, Ryan Hunter-Reay in the No. 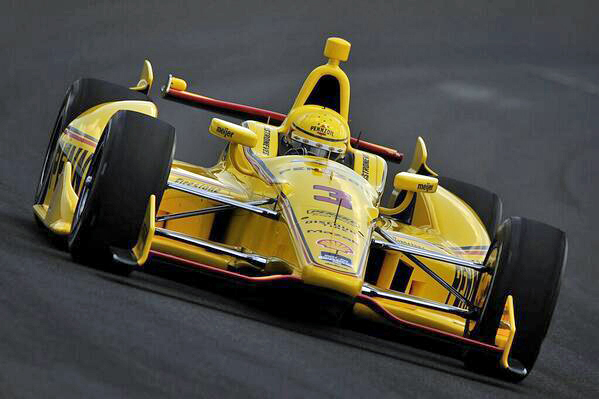 28 Andretti Autosport DHL Dallara/Honda, laid down the fast lap of the day, and the only lap above 225 miles per hour. The quickest Target Chip Ganassi entry was Tony Kanaan in the No. 10 car, running a total of 131 laps with the quickest coming on lap 107 at 222.635 mph. Twenty six drivers ran faster than 220 miles per hour.